By: Erik Hyrkas on October 10, 2018. There’s a new tablet accessory in town, and it’s called Handle Plus. 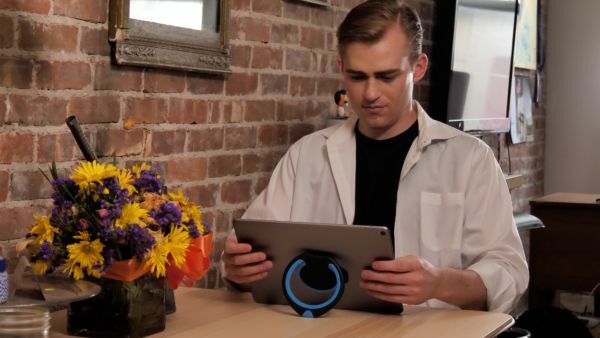 Designed by French engineers, this clever Kickstarter product is an attachable tablet handle, much like a ring handle or Popsocket for smartphones. The Kickstarter launched on Oct. 1 with a goal of $10,011. At press time, Handle Plus had already reached over $8,700 (continually adjusted from HK$ exchange rate). But how does it hold up in the real world against clumsy multi-taskers? To get the feel for the product, we opened a pre-order review unit sent by the company and took it for a spin. Read on below for our overview of the product. The device is pretty self-explanatory in name. Handle Plus is a plastic handle with a sticky back adhesive you can stick to any tablet. iPad, Galaxy Tab, Fire, or otherwise, it will stick to the back and even rinse clean if needed for reuse. It most resembles a larger version of phone ring handle products, with a large ring attached to a hinge and flat piece that attached. Rather than fitting around your finger, Handle Plus will fit around most anyone’s entire wrist (save for Popeye), and is meant to be used as an easy-to-carry handle. While this accessory is plastic, pieces of the actual handle are rubberized, and it’s entirely round (no rough edges), so it doesn’t feel cheap or uncomfortable to hold. The handle swivels away from the base an entire 180 degrees, so it’s perfect for adjusting your specific grip. You can use it as a kickstand on a table or even in bed. Ours came in black with grey accents, but there are apparently four color options. Smartly, much like Popsockets, Handle Plus will eventually put any logo and color scheme you want on a Handle Plus, making it perfect for cashing in on marketing firms. Say hello, Instagram. But there’s more than meets the eye to this $30 (check Kickstarter backer options) handle and kickstand. Handle Plus rotates 360 degrees, and each 45-degree twist of the handle locks the handle in place, in a different position, taking eight clicks to make it all the way back around. Moreover, this means Handle Plus can be adjusted to nearly any situation (landscape, horizontal, diagonal, etc.) There is about a half-inch lip between the the adhesive and the base/handle when flat. That means this product is thicker than any tablet, so if there’s one main criticism of this product, it’s that the bulk-factor may dissuade some gadget purists from identifying with the girth of this accessory. As a lover of the Popsocket, my biggest complaint of accessories with round handles/kickstands is that there is no flat piece to stabilize it when on uneven ground. Thankfully, Handle Plus has a one-inch wide flat spot on the bottom of the handle/kickstand, so it can physically stand level on any surface, no matter how soft. Sure, it’s a small detail, but it’s one that makes a difference between this and inferior handle accessories. This handle comes with easy-clean gel adhesive already installed on the back, so it should stick to any tablet regardless of material. We used it on our plastic Kindle Fire, but we can tell it would stick just as easily on an aluminum iPad. And if not, Handle Plus sends an alternative 3M sticker adhesive included with the product. According to the designers, Handle Plus is helpful for drinking, carrying bags, keys, and anything else where coordination and multi-tasking can be disastrous, like walking and/or chewing gum. In Washington, D.C., I’ve actually seen this happen to people trying to hold iPads on Metro platforms. You know, some dude is in the midst of a deep read of a Tech Void review, and then, lo and behold, someone bumps into him causing a $500 tablet to fly out of their hands onto some hard concrete. A Handle Plus can most definitely avoid that circumstance entirely. In our testing, we couldn’t shake the tablet off the handle at all. The adhesive is rated for 10 kg (22 lbs), so provided you aren’t doing weight lifting with the Handle Plus, this should be able to deal with all the gravitational forces you can throw at it. We were actually more worried about damaging the handle, but with its tight hinge, we couldn’t sway our tablet an inch with an honest effort. That said, everyone knows wear and tear on gel adhesives eventually takes its toll (even if you can wash it) so you might eventually need another solution. During the review, I particularly liked being able to use the kickstand for any and all situations. Reading in bed, scrolling news sites on a table, or simply dangling the handle around my wrist while carrying dinner back to the couch was clutch. The product has so many uses (if you actually use your tablet), I’m more worried about walking into walls staring at my device than dropping it, because it’s so easy to grip. This might make the argument for some laptop-in-bed users to switch back to their iPad, too. Carrying a six-pound computer around the house to watch Netflix just doesn’t make sense when you could use a simple kickstand like this to prop up a tablet instead. If you’re looking for a cool Kickstarter investment or a better way to use your tablet hands-free, Handle Plus might be it. Personally, I love how robust the product is. That said, a slimmer and more clean-cut version might be more attractive to those who hate the idea of a Rubbermaid-esque accessory blemishing their pristine and expensive gadget. You can get an early bird Handle Plus for yourself while preorders last for $25. The campaign ends in five weeks. Last updated by Erik Hyrkas at October 10, 2018 .